It was previously stated that Jeff Radebe stressed that 27 new projects would stimulate 58 000 new jobs, mostly during construction and mostly in the rural areas of the Northern, Eastern and Western Cape provinces, as well as the North West, Free State and Mpumalanga provinces. There was potential to create a further 1 500 jobs in the manufacturing sector as a direct spin-off from the projects. We have to see and wait what will happen in future. B-BBEE is also supported – South Africans own 57.8%, or R11.9-billion, of the companies awarded projects during bid windows 3.5 and 4. Of that, black shareholders own 64.2%, or R7.64-billion. The National Development Plan (NDP) identifies the need for South Africa to invest in a strong network of economic infrastructure designed to support the country’s medium- and long-term economic and social objectives. Energy infrastructure is a critical component that underpins economic activity and growth across the country; it needs to be robust and extensive enough to meet industrial, commercial and household needs. 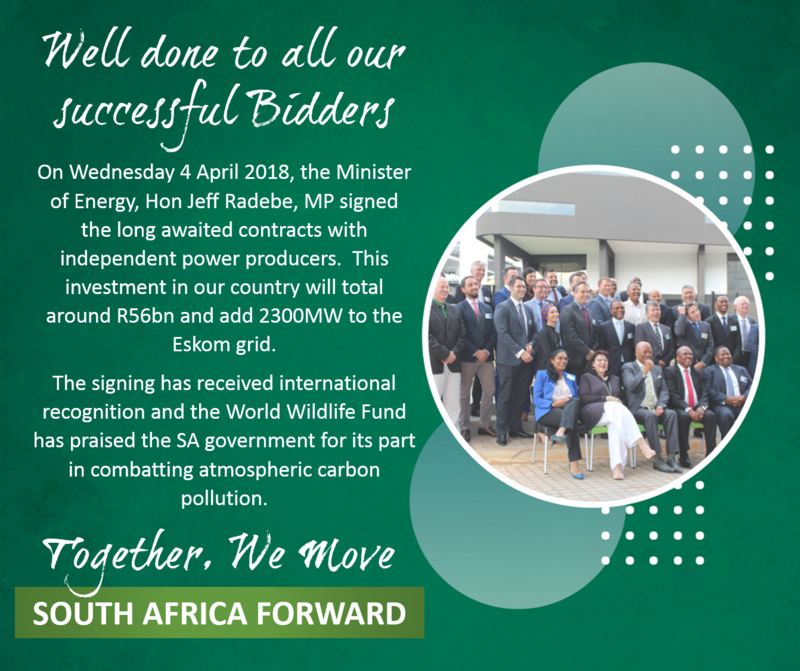 The Department of Energy (DoE), National Treasury (NT) and the Development Bank of Southern Africa (DBSA) established the IPPPP Unit for the specific purpose of delivering on the IPP procurement objectives. In November 2010 the DoE and NT entered into a Memorandum of Agreement (MoA) with the DBSA to provide the necessary support to implement the IPPPP and establish the IPPPP Office. 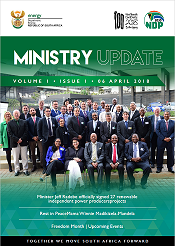 The activities of the office are in accordance with the capacity allocated to renewable energy and non-renewable generation in the Integrated Resource Plan (IRP) 2010; subsequent ministerial determinations and DoE support service requirements. Monitoring, evaluation and contract management services (as from 7 July 2014) – with contract period of 20 years. It has been applauded for effectively avoiding the quicksand of laborious administrative arrangements, without undermining the quality or transparency of the programme. The IPPPP partnership is funded by a Project Development Facility (PDF) financed through bid registration fees payable by all bidders and the Development Fee paid by selected bidders. The NDP requires the development of 10,000 MWs additional electricity capacity to be established by 2025 against the 2013 baseline of 44,000 MWs. The (policy adjusted) Integrated Resource Plan (IRP) 2010 developed the preferred energy mix with which to meet the electricity needs over a 20 year planning horizon to 2030. In line with the national commitment to transition to a low carbon economy, 17,800 MW of the 2030 target are expected to be from renewable energy sources, with 5,000 MW to be operational by 2019 and a further 2,000 MW (i.e. combined 7,000 MW) operational by 2020. Planning requirements further include capacity to supply for base load and medium term risk mitigation (MTRM) plans. In May 2011, the Department of Energy (DoE) gazetted the Electricity Regulations on New Generation Capacity (New Generation Regulations) under the Electricity Regulation Act (ERA). The ERA and Regulations enable the Minister of Energy (in consultation with NERSA) to determine what new capacity is required. Ministerial determinations give effect to components of the planning framework of the IRP, as they become relevant. Twenty-four of the projects are either solar photovoltaic (PV) or onshore wind developments, but the list also includes the Redstone Concentrated Solar Power (CSP) project, in the Northern Cape, the Kruisvallei mini-hydro project, in the Free State, and the Ngodwana Energy biomass project, to be fuelled using waste Sappi wood chips, in Mpumalanga. The 12 solar PV projects are listed as Aggeneys, Bokamoso, De Wildt, Droogfontein 2, Dyason’s Klip 1, Dyason’s Klip 2, Greefspan 2, Konkoonsies 2, Loriesfontein Orange, Sirius 1, Waterloo and Zeerust. The 12 wind projects were named as Copperton, Excelsior, Garob Wind Farm, Garob Valley, Kangnas, Oyster Bay, Perdekraal East, Roggeveld, Karusa, Nxuba, Soetwater and Wesley-Ciskei.